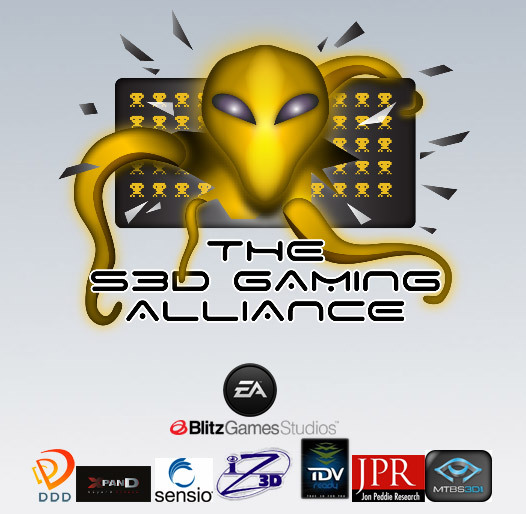 Great news for the S3D community as the S-3D Gaming Alliance (S3DGA) gains more and more members and attention not only from the gaming industry, and this is happening unexpectedly fast. It seems what began as a surprise announcement at SIGGRAPH 2009 has quickly become an industry-wide movement to ensure the adoption of stereoscopic 3D (S-3D) gaming in consumer homes around the world. The association is very honored to announce that Habib Zargarpour, as a representative of Electronic Arts (EA), has joined S3DGA’s advisory board. As demonstrated at SIGGRAPH, game developers want to see industry-wide support for stereoscopic 3D gaming, and this is the first of many steps towards this goal. “When I saw ‘Need for Speed SHIFT’ in stereoscopic 3D at SIGGRAPH, I was impressed. The audience was blown away by how well ‘SHIFT’s’ immersive cockpit was represented by the 3D tech, and we see a great future for S-3D in games. We need an industry-wide standard for S-3D gaming, and S3DGA has the drive and experience to push this forward. All developers and manufacturers should participate,” said Habib Zargarpour, Senior Art Director for Electronic Arts Inc. The company Lightspeed Design started showcasing their new DepthQ s3D WebPlayer that can allow the easy streaming of SD and HD video online over your web browser with very good quality and results. The s3D WebPlayer is using Flash technology to deliver the anaglyph content the the demo videos are looking very good even when looked with not so fancy Stereo 3D technology such as the quite popular and very affordable anaglyph one. You just need a pair of normal paper anaglyph glasses (red/cyan filters) and an up to date version of the flash player installed for the browser you are currently using and you are ready to watch high quality anaglyph stereo videos without having to cope up with the normal compression artifacts you normally see when streaming this type of videos. At the moment you can only see example video with the DepthQ s3D Flash WebPlayer streamed from their website and the video actually has quite nice color reproduction that you don’t normally expect when watching stereo anaglyph videos. This is done thanks to the specially optimized anaglyph mode that the company is using instead of the normal mode, when colors are not so easily percepted and the videos usually don’t have very good colors.